Keystone NAP has delivered the first modular “KeyBlock” unit to its data center on the border between Pennsylvania and New Jersey. 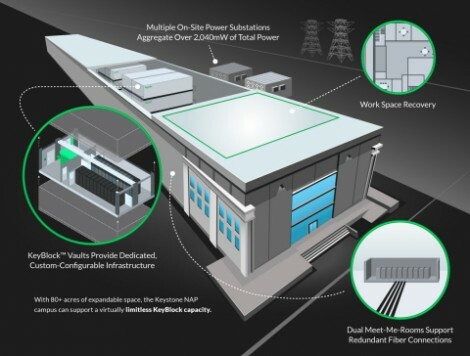 The modules were co-developed with Schneider Electric and are configured to each individual customer's power, cooling, and network connectivity needs. There are a lot of interesting layers to the project. Keystone is converting a former Bucks County, Pennsylvania, Steel Mill into a data center and leveraging the existing power infrastructure and unique cooling resources. The KeyBlocks are highly configurable stackable modules. They can be stacked three high. The first KeyBlock arrived before the building fit-out was finished to demonstrate the capabilities to the customer -- something that wouldn't have been possible to do with a traditional approach. KeyBlock modules include racks, power distribution, and cooling gear in a variety of configurations, from a couple to a hundred racks. The solution includes scalable 2N generator and UPS capacity. The first KeyBlock arrived in two parts on flatbed trucks and currently sits in the former motor room of the steel mill. The foundation in the motor room is designed to withstand 80 tons. A number of companies, including giants like Microsoft, Google, and Amazon, have used data center modules, or containers, to add data center capacity. There are also several data center colocation providers, such as IO, and Verne Global, that lease space in modules housed in massive warehouses. Schneider has been expanding its modular data center portfolio over the past several years, including the acquisition of Barcelona-based module maker AST Modular early last year. Among its other modular data center customers is the Chinese Internet giant Baidu. "It was one of the most interesting rigging jobs I’ve ever seen, and I’ve seen a lot of this stuff," said Jason Walker, director of Schneider’s Data Center Service Provider business segment. "This project started a little bit over two years ago and is the second attempt at building a data center on the [former steel mill] property. Things really started ramping up about six months ago." The original attempt was by a company called Steel Orca. Schneider was also involved in that project. Ritz has told Philadelphia Business Journal that the Steel Orca project fell through, making way for the formation of Keystone, but did not elaborate. Keystone President John Parker was involved with Steel Orca as an attorney, according to multiple online sources. The Steel Orca trademark has been abandoned, according to Justia's trademark database. Walker said Keystone's project stands to succeed because of strong financial backing and because of the modular approach, which enables the company to deploy capital incrementally. "A major reason this project got off the ground was the very nature of this prefabricated piece," he said. "They’re retrofitting, but not in that 'stick facility' way. It meant Keystone reserved capital without needing to build from day one and didn't need to do a lot of phasing." Stackability of the modules allows Keystone to maximize space utilization. “The architecture ... allows us to take the KeyBlocks and stack them three high, two stacks right next to each other,” Carey said. Two stacks combine to create an almost-square (45 feet by 42 feet). A crane is coming in the next week or so to be installed inside the building permanently to lift and stack modules. “We have some prospects who want half a stack or three stacks at the same time,” Ritz said. The provider plans to offer power densities from 100 watts to more than 400 watts per square foot. Each module, secured with multi-factor authentication, acts as an individual customer's vault. The company can provide individual power, cooling, and connectivity service level agreements for individual modules. It wants to automate every part of the configuration process as much as it can.